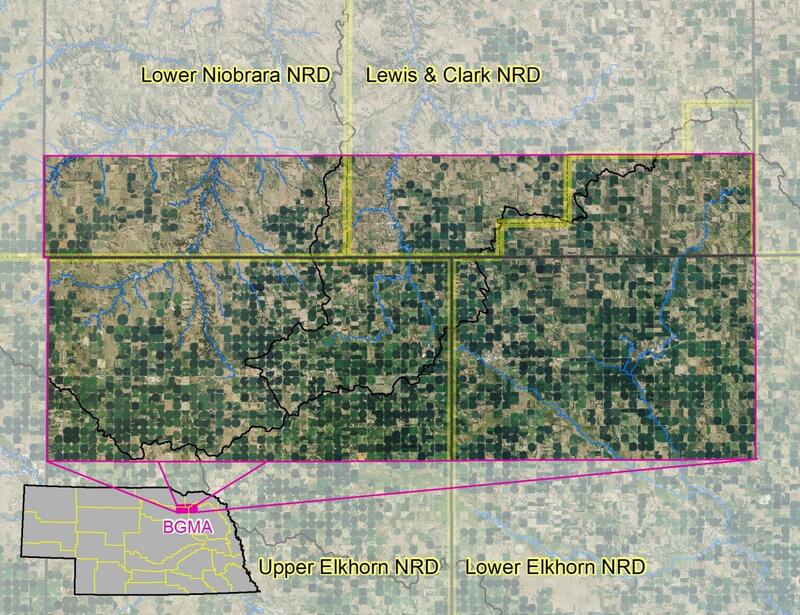 The Brazile Creek Groundwater Management Area encompasses 756 square miles of north-central Nebraska. 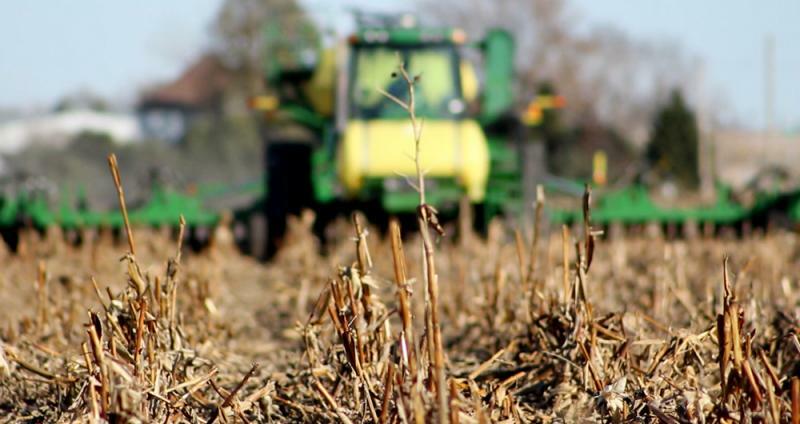 Farmers rely on nitrogen fertilizer to maximize their bushels of corn and soybeans. But nitrogen not used by plants—because too much was applied, or the timing was off, or the rain or irrigation washed it away—makes its way into the water supply. 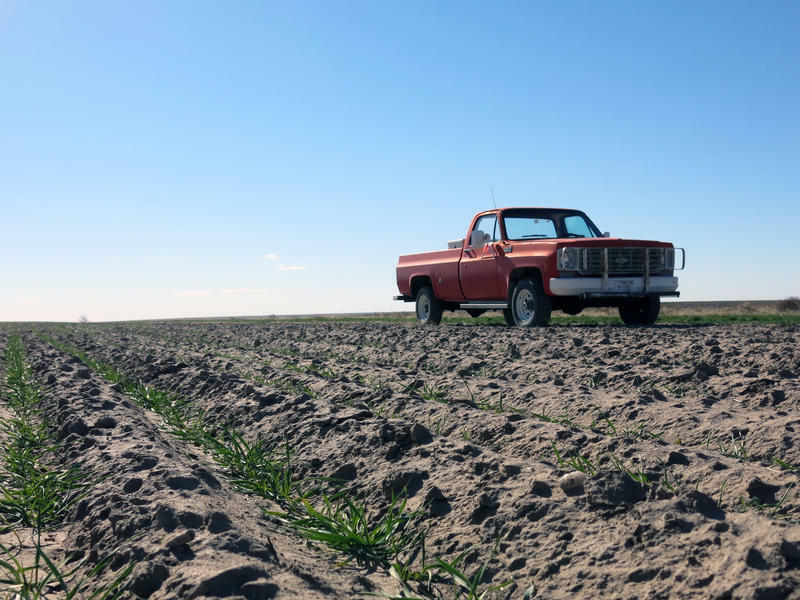 Farms sit shoulder to shoulder across this part of the high plains, where shallow water tables and sandy soil have accelerated the movement of nitrates into the groundwater. Excessive nitrates in drinking water can hurt the body’s ability to move oxygen in the blood, which is especially dangerous for newborns and pregnant women. But this isn’t new information for the producers in the room. Brazile Creek flows through the town of Creighton, Nebraska, including through the golf course pictured above. More than 7,000 people in this region, known as the Bazile Groundwater Management Area, rely solely on groundwater contaminated by nitrates for the water they use to drink, bathe and wash. Jenkins coordinates a program trying to clean that groundwater up. But Marty Link of the Nebraska Department of Environmental Quality says it’s hard to address pollution that doesn’t come from one specific source. Pollution emanating from a specific place, like out of a factory, can be regulated. But here, the 756-square-mile area of concern spreads across four local groundwater districts that each have their own water quality rules. In 2011, the districts decided to work together, along with the state, in an effort to address the problem comprehensively. Last fall, the U.S. Environmental Protection Agency approved their plan, making it the first plan in the country to qualify for funding normally reserved for surface water projects. Link says this new funding could make a big difference for Nebraska, where 85 percent of the population relies on groundwater. Though it’s possible the funds could be impacted by President Donald Trump’s proposed cuts to the EPA, Link hopes their collaborative work could serve as a model for other farm communities dealing with high groundwater nitrates. There’s already some money available for water quality improvement. But this new plan will provide more money to treat the problem at its source: on farms. The plan is to help farmers adopt practices that reduce the amount of nitrates getting into the groundwater, like planting cover crops, testing the amount of nitrogen already in the soil, and implementing more efficient irrigation methods. A map of the Brazile Groundwater Management Area, which stretches through four water districts and three counties. The success of this groundwater cleanup relies on more producers taking advantage of cost-share programs, says Steve Keck, an independent agronomist who has worked with area farmers for decades. “Some people really embrace these programs and try to utilize the different tools,” Keck says. But because they’re voluntary, participation is mixed, he said. Jim Fuchtman, one of the producers who has taken advantage of existing funding, says the region’s longstanding nitrate problem is mostly the result of practices used by farmers in decades past. On his 100-year old farm near Creighton, Fuchtman uses cover crops and tests the amount of nitrogen and moisture in his soil before he applies fertilizer. Fuchtman says his family relies on a home reverse osmosis system for their drinking water because some of his wells have nitrate levels two- to three-times the safe drinking standard. But he says he’s not that concerned. And margins are tight, so he and other producers don’t want to waste expensive fertilizer. “It's contaminated water as some would view it, but that nitrogen is good for crops and I'm able to pull that out of there and utilize some of it so it saves me on some of my fertilizer costs,” Fuchtman says. If they can convince enough farmers to make changes, the groundwater districts hope to stop nitrate levels from increasing within five years. They expect it will take up to 20 years to bring them back down to the safe drinking range. President Donald Trump issued an executive order Tuesday directing the Environmental Protection Agency to revise a controversial environmental rule opposed by many Midwest farm groups. Trump ordered new EPA administrator Scott Pruitt to formally revise the Obama Administration’s 2015 Clean Water Rule, also known as the Waters of the U.S. Rule, which was meant to explain which rivers, streams and creeks are subject to regulation by the EPA.